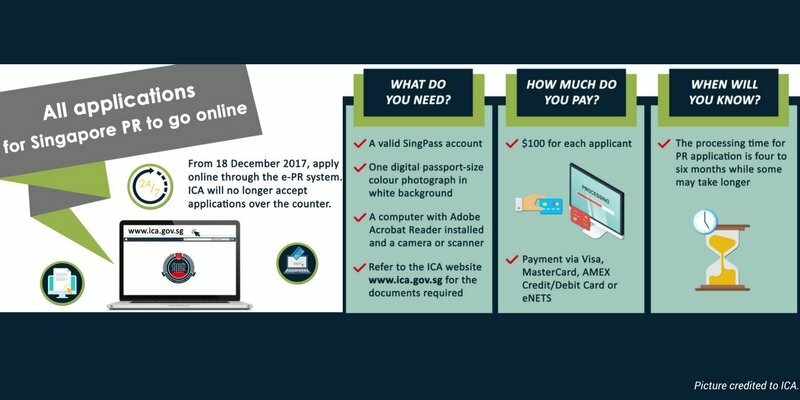 Come 18 December 2017, the Immigration & Checkpoints Authority (ICA) will be introducing an electronic-Permanent Residence (e-PR) system and a processing fee for PR applications. PR applicants currently have to make a trip to the ICA building to secure an appointment with ICA to submit their PR application documents. With this new e-PR system, applicants will no longer need to do that. Instead, they can enter required information into an electronic application form on the ICA website. Supporting documents can also be scanned and submitted electronically. PR applicants presently are not charged a processing fee; however, successful applicants pay $100 for an Entry Permit. ICA is introducing a processing fee of $100 per applicant at the point of submission of PR application. Successful applicants will also pay a $20 fee for the Entry Permit. The new fees are to manage the rising operating costs of processing PR applications and will take effect from 18 December 2017. Beginning 18 December 2017, ICA will only accept PR applications through the new e-PR system and will no longer release any e-appointment slots. Those who have already secured appointment slots are not affected and can continue to submit their hardcopy applications during their ICA appointments. They will also not be affected by the new fee structure.